This is the 4th installment to my mini project to create at least two (2) Halloween nail art for the whole month of October. Halloween is just around the corner. Here in the Philippines, we don't really celebrate Halloween with festivities like Treat or Tricking. But we have All Saint's Day and All Soul's Day that we commemorate every 1st and 2nd of November, respectively. During this days, we take time to remember our dead and it has been our practice to visit them in the cemetery. 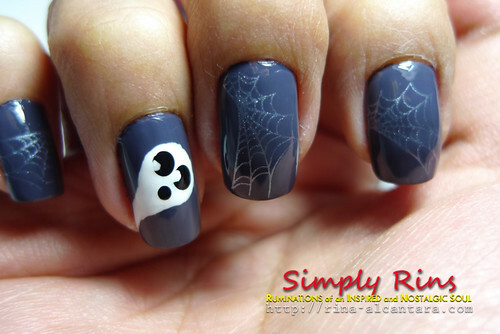 Anyway, today's Halloween nail art is quite simple. This ghost is definitely not spooky. I'm afraid of ghosts. I haven't seen one and I don't want to see one. Well, at least in real life. 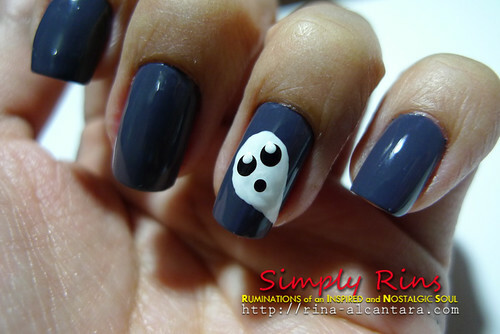 The only ghost I want to see are the ones I painted on my nails! This is 2 coats of Zoya Kelly. This is a recent purchase and I'm so loving the color. It looks like bluish gray. Application of the polish was easy and quite shiny by itself without top coat. As always, I try to create freehand nail art using simple shapes. I used a teardrop shape for the body of the ghost and dots for eyes and mouth. I could be satisfied with this results of just having a ghost per hand but I felt I needed to add something to the other nails. 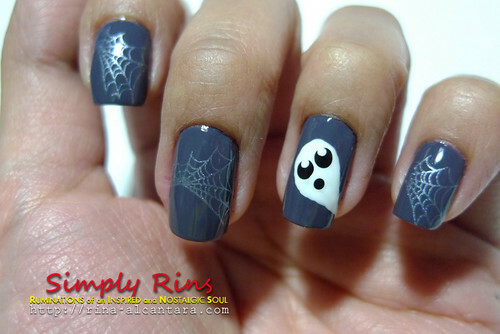 And so, I stamped spider webs on the other 4 nails using an image from Bundle Monster BM13. I used Konad silver special polish for stamping. I didn't want to lose the color of the polish that much so I went for a more subtle effect. This is my right hand, still with just one cute (?) ghost. Note: To those who are interested in purchasing Zoya nail polishes, Organic Rituals Spa is selling this toxin free nail lacquers. They are also accepting pre-orders. To know more, please checkout the Organic Rituals Facebook Page. You may also book an appointment for a much deserved pampering and see their Zoya nail polishes collection that are for sale. Kelly is such a pretty color! and the ghosts are so cute! Yes, I'm loving Zoya Kelly. :) You're all being too nice regarding my ghosts! you are AMAZING! love your art. cutest ghostie ever.